When launching a new campaign, an advertiser should set specific goals. The progress being made toward these objectives then determines where any optimization efforts are focused. 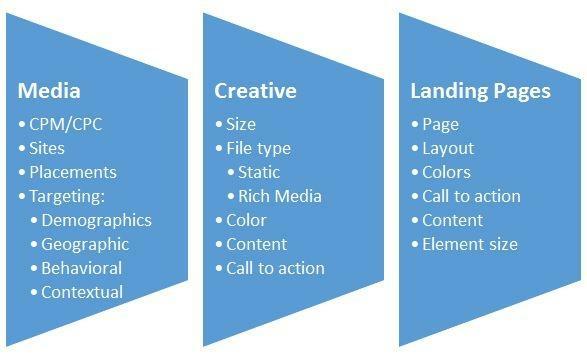 For example, if the campaign is delivering clicks and has a strong clickthrough rate (CTR), but is not generating conversions, the advertiser should focus on landing pages, particularly if conversion is a goal. Testing strategies also play a considerable role in campaign optimization. Whether testing different offers in a banner, the images on a landing page, or the button size for a call to action, these strategies allow advertisers to pinpoint which messages resonate with the target audience. However, when setting up such tests, it is important to isolate one element. An advertiser should not test multiple variables at the same time (e,g., testing the form alignment and button size on the landing page). The data will not be able to indicate which specific facet provided the lift to the campaign. With so many aspects to examine, it’s best to keep it simple. Identify which variable will make the biggest impact and focus on that first. After the campaign flight has ended, you can then take the learnings and apply them to the next campaign. Continue to test and optimize your display campaigns and your performance will gradually increase. The post Testing Different Strategies to Optimize Your Display Campaigns appeared first on Search Optics Blog.